Our Stainmaster carpet was installed earlier this week and it’s even better than we imagined it would be! We talked about it in this post, but wall to wall carpet has kind of gotten a bad rep in the last decade. And while I understand the appeal of hardwood floors, there is an undeniable coziness with carpet that, ooo!, just absolutely made the downstairs. Our previous carpet (photo below, taken during our walk through) was your run of the mill, oatmeal colored, cheap, medium-to-high pile carpet. I’m sure you know it well, too. 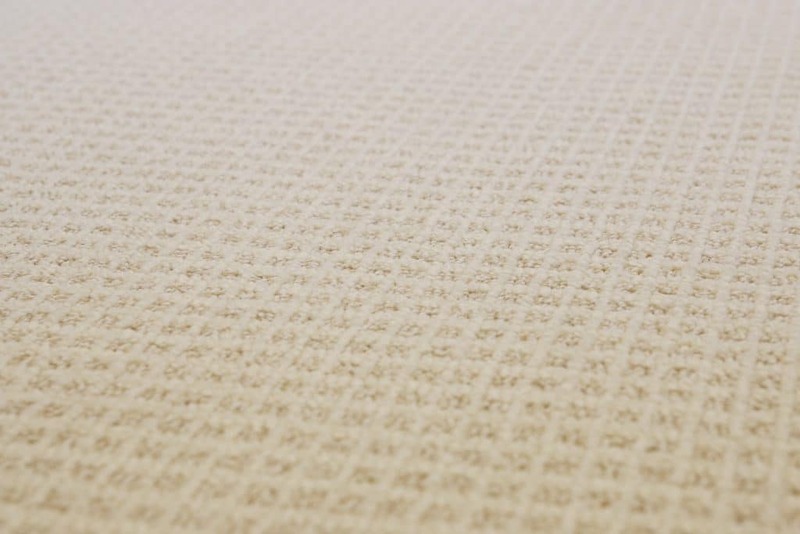 Often times people think that a higher pile carpet automatically means it is cushier and then skimp on the carpet pad, too. At least that is what happened here and in our last house and in our apartment before that. And then you end up with stringy carpet that’s not very soft on top or underneath. When choosing our carpet pad, we really had our girls and Charly in mind. While the Stainmaster carpet has a lot of warranties and characteristics that repel stains or make them easy to clean, we worried about what happened below if something did spill. You can clean your carpet, but you can’t really clean your pad. 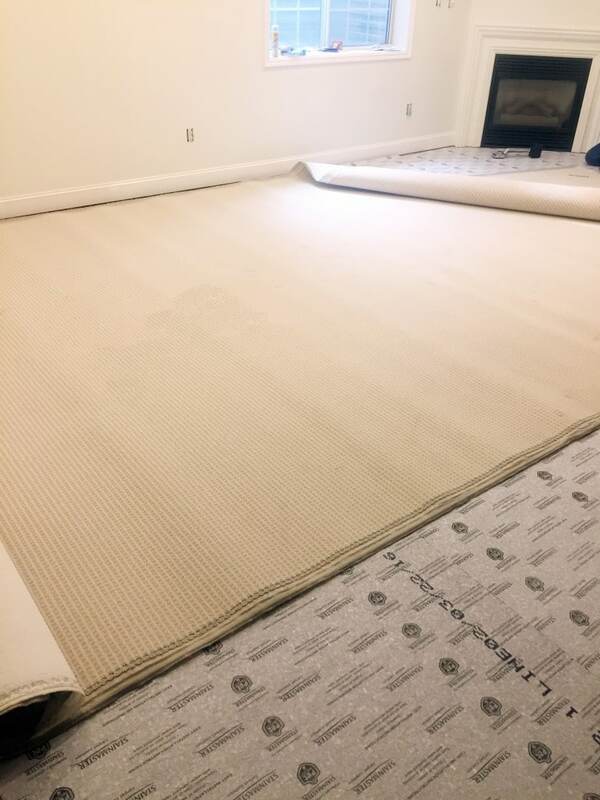 We went with a PetProtect carpet pad that has a breathable moisture barrier which keeps common household spills out of the cushion while allowing water vapor from below to evaporate–which is also important considering our basement is concrete. I don’t know how they do it, but it won’t trap moisture and spills won’t soak through. It even has a special treatment applied that resists mold and mildew in the cushion! We removed all the old carpet ourselves (with the help of some amazing young men in our ‘hood) so the actual installation took a crew of 4 guys one day. After the pad went down, which was quick!, they started with the carpet which the lead guy later told us was one of the hardest carpets he had ever installed. All those checks! The wanted to make sure they all stayed level and square, even on the seams and stairs. That attention to detail–it looks fantastic! 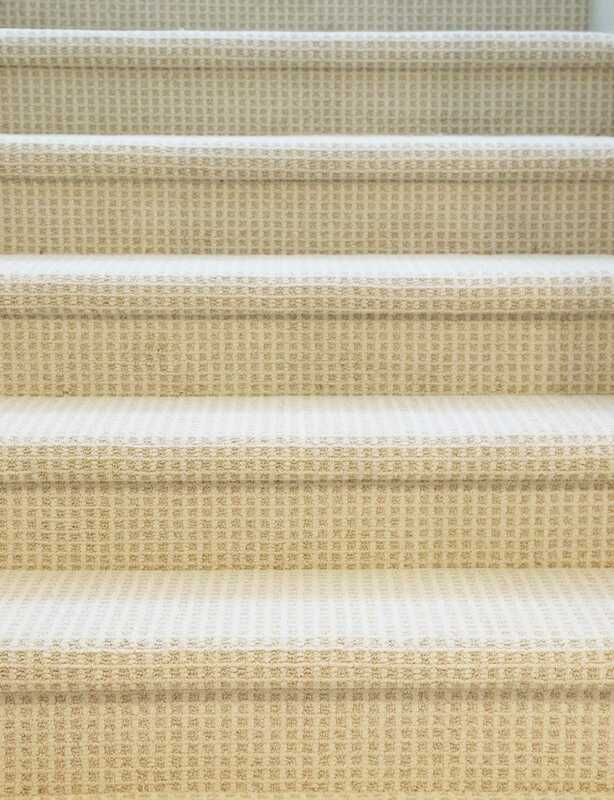 You can read more about our carpet choice in this post, but as a refresher, we chose the Stainmaster Medford Line in Fizz meant for active families. It’s a low pile looped carpet (my favorite) with small checks made with a color variance. It retails at Lowe’s for about $2.98/sq ft. While the lower pile feels so smooth and soft under foot, I also think it is the most ideal type of carpet for layering rugs on top (which we’re doing down here). 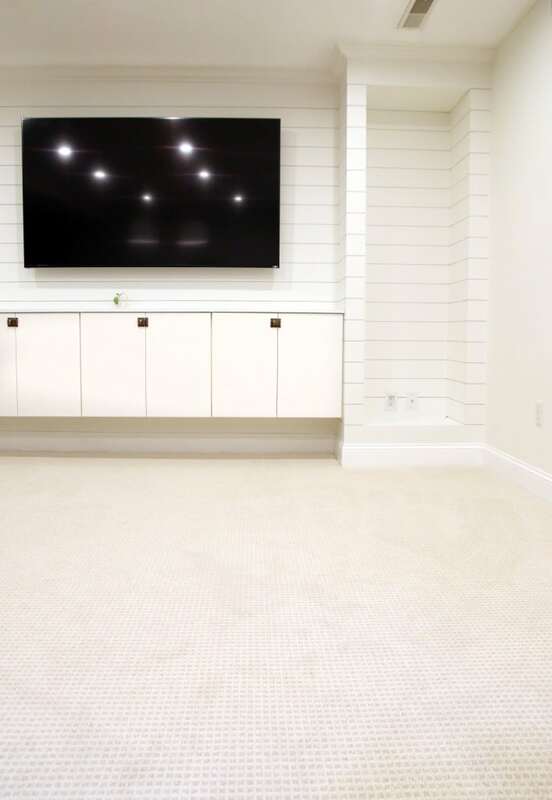 I imagine if we picked a darker color, it could pass for a sisal or natural fiber rug, but we really wanted to keep the floors light and bright, knowing it would have the same effect on the entire basement. On the initial rug post, we had a few readers concerned about choosing such a light colored carpet, and some even strongly warned us to go with something darker. 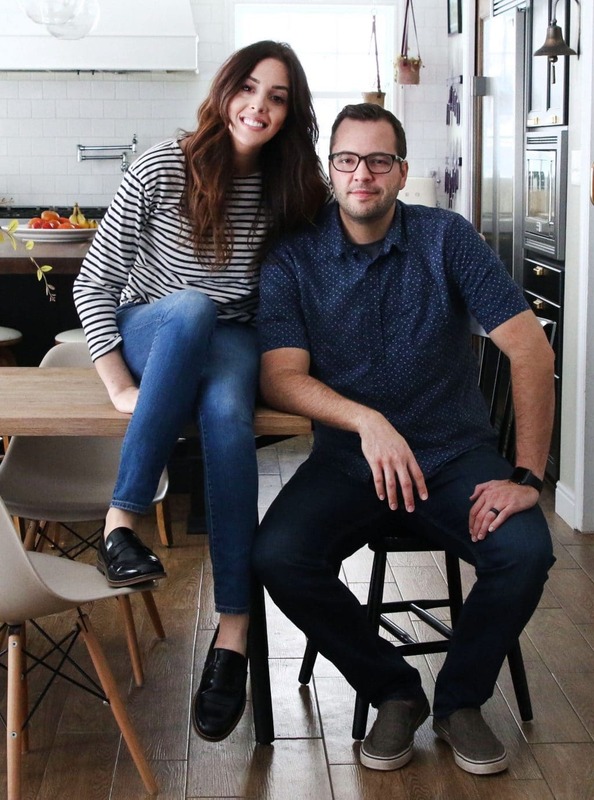 We felt confident with moving forward with our choice and have no regrets or concerns. Our downstairs is pretty low traffic and while we don’t mind shoes on the wood tile upstairs, we do take off shoes to come down here. Also, we want to give this Stainmaster carpet a run for the money! Haha! We’ll keep you updated on how it wears over time. This weekend we’re installing the wood shelves in our entertainment built-ins and hopefully enjoying a family movie night, even if it will be on the floor–it’s that soft. Happy Weekend! 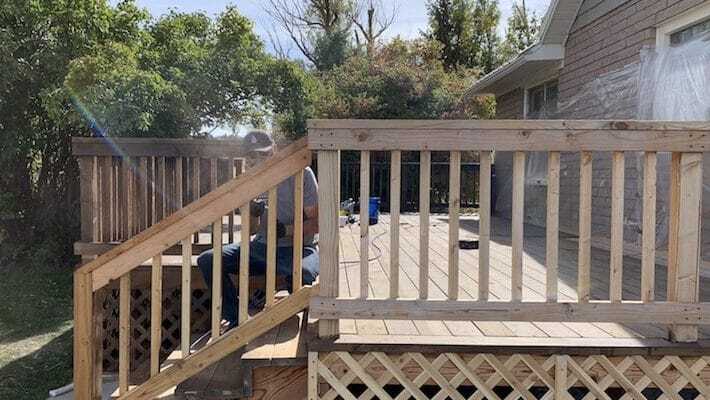 Proud to be partnering with Lowe’s and Stainmaster on this project. « Before and After: Our New Front Door! Great read, you have a beautiful carpet. Thanks for sharing this. Hello, I have a quick question. 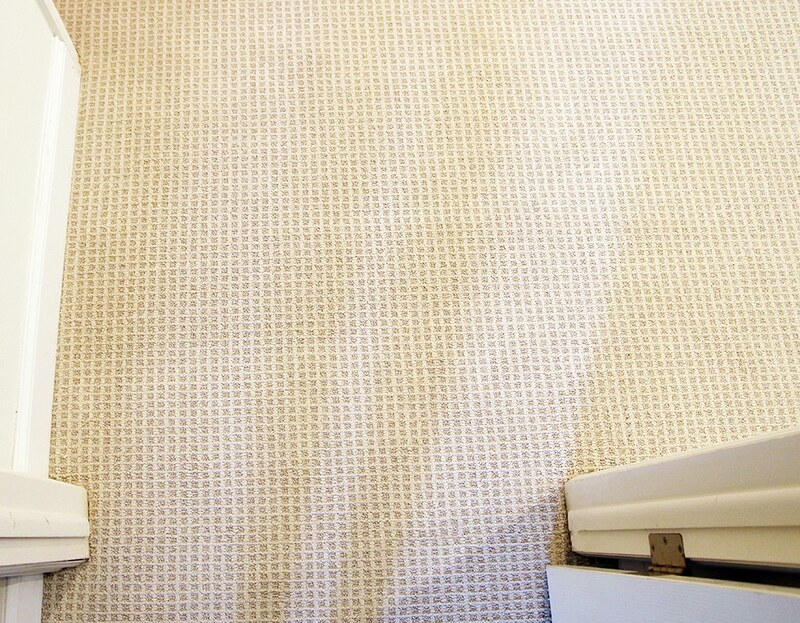 We have been trying to have this exact carpet installed and twice now the installers are saying the seams are off. Lowe’s told us it was not possible to have this carpet installed!!! What are the dementions off your room so I can take this to Lowe’s? Now that its been about a year since installing your new carpet, I was wondering if maybe you could share an update on how its held up to family life with kids and pets. We are currently researching options to replace the carpet on the second floor of our home. 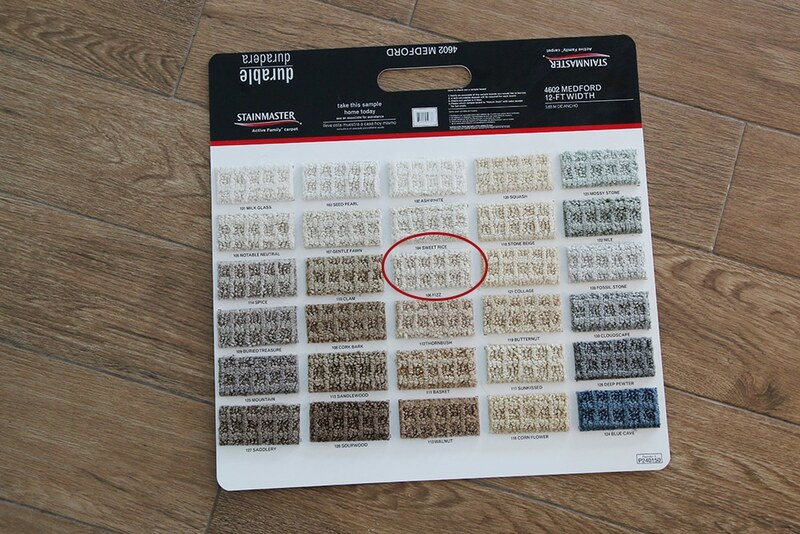 I’m leaning towards a lighter color Stainmaster carpet and everyone looks at me like I’m crazy! 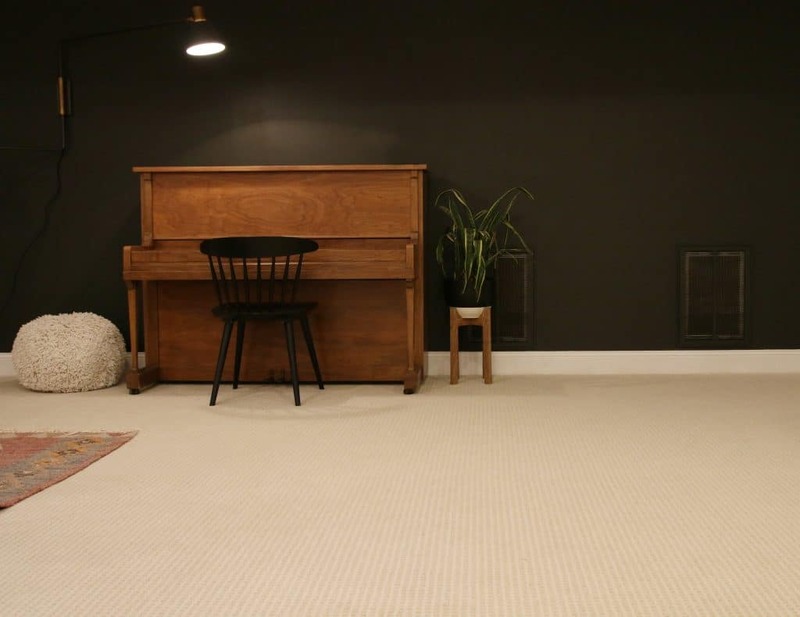 Everything I read on the internet suggests that people regret choosing a lighter colored carpet – but it seems like you guys are still really liking yours and don’t regret your decision! Also, I am wondering what the maintenance on the carpet has been like for your and your family. I’m sure you regularly vacuum – but am wondering if you’ve use a carpet cleaner or any other regular maintenance to keep it looking clean? Also wondering if you’ve had any mishaps and needed to use any special treatment to avoid a stain. I’m actually working on a post covering all of this. But in short, we still love it so much. We have had it professionally cleaned once (after 6 months) and will likely get it cleaned again after our bathroom renovation is completely downstairs. There are no dark marks or stains, but I heard you are supposed to get your carpet cleaned every 6 months and I found a good deal in my area–haha. I will say, our dog rarely goes downstairs and we always take our shoes off when we do. Julia, did you ever keep that kitten? I’m looking at getting the same carpet in my basement but I have 2 cats with nails. I was wondering if you thought the carpet was cat-friendly with the loops? Thanks! Oh, no we didn’t. My daughters were both very allergic unfortunately. Would also like an update on how it’s doing? Thanks!! LOVE your carpet selection. Your posts about this process have actually made life easier for my hubby and me. We are moving and will be re-doing the carpet in the new house. We will likely be going with your choice haha. Would love to know if you’re still loving the carpet and how it’s held up these past six months? We have a dog, a toddler and a baby on the way, so definitely wanting durable. Thanks so much! I really love the square patterned carpet you chose. I really want to replace my carpet with something more modern like that. My carpet looks like it’s from the 70’s. It’s funny how just adding a little more texture to the carpet added so much to your home. Like you said, your previous carpet wasn’t unappealing or ugly, it was just kind of bland. I’m glad that you decided not to settle, I’m sure when you finish decorating the carpet will tie everything in nicely. Thank you for sharing! 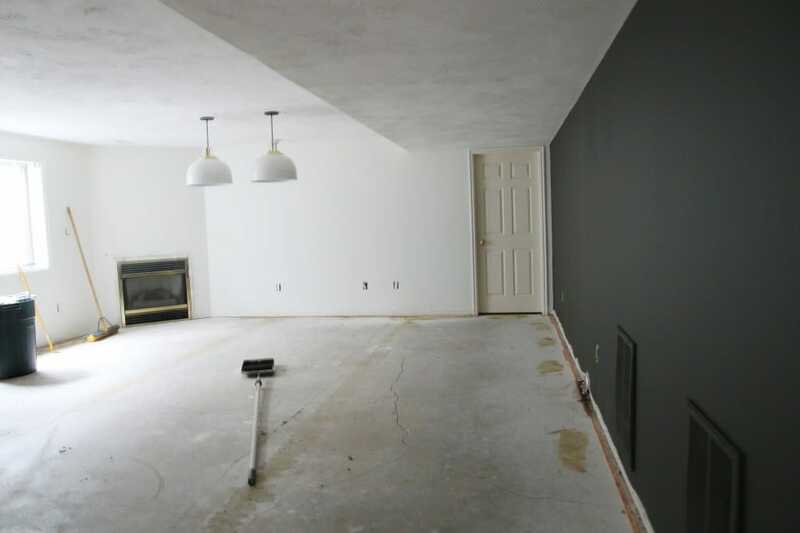 I was wondering if you guys tore out the tack strip along the walls when you ripped out the carpet? I just ripped out the carpet and tack strip in our living room. We are looking to replace the carpet, but are wondering if Lowe’s reinstalled the tack strip or used what you all had before. Thanks! We left the tack strip and they re-used it. However, the places that didn’t have it, they laid new tacking no problem at all. I have been searching for carpet for my children bedrooms and brought home the exact sample you put in your basement then came across your post. I have a question and would like to send a picture of my current carpet, (just installed and not satisfied so looking for a replacement) would you mind emailing me directly? I would so appreciate it, carpet is a huge decision. Thank you! Feel free to shoot me an email, Kelly! While I have had some experience with cleaning carpets, I have never really installed them. The tip above about using PetProtect carpet pad which has a breathable moisture is really awesome. I think I’ll be using these from now on because that can make a huge difference when cleaning the carpet after a stain, especially if it is something like a wine stain that can sit there and discolor the carpet fibers. Cheers for that! I am one of the people that would have cringed when you decided to go for a light carpet. However, I am also a firm believer in you getting what you like best. 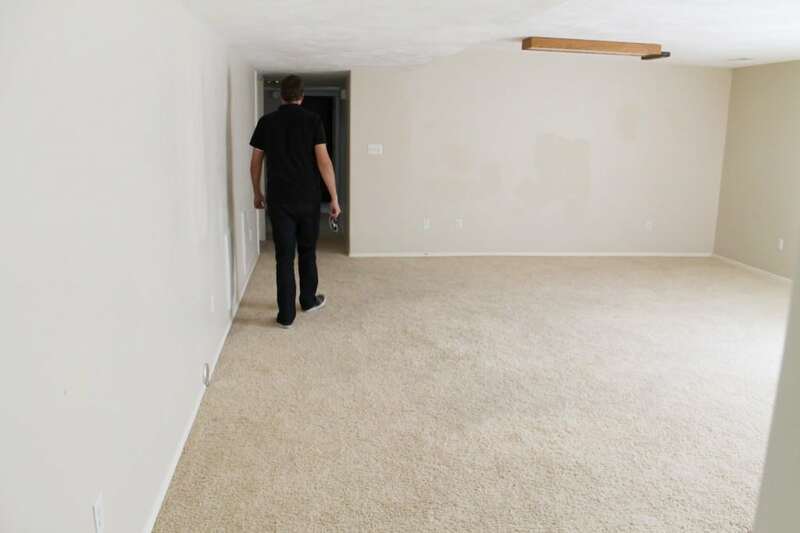 Having a light carpet in a basement where there is low traffic does seem like a good idea to me. It would definitely help make the basement lighter. That is really pretty carpet you got. The creamish color with lighter colored squares looks really good. I think something like that with more of a blue tinge would look really good in my living room. I never regretted our light carpet in our previous home for a minute. 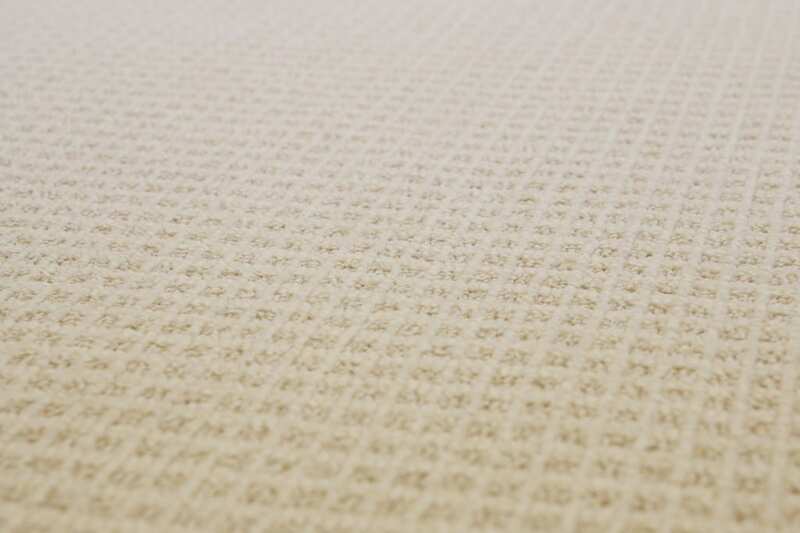 However, I selected this same Stainmaster carpet in cornflower for our sunroom since it was the main room our dog came in and out and can confirm it looks like sisal, but is so much softer. I know you’ll love yours for years to come! Love the way your basement is coming out!! We are in desperate need of a sectional! We’ve had the same couches for 10 yrs!! I love the Sloan with a right arm in ash with natural wood legs. I really like your built-ins. Are those pre made and you assembled into that configuration? Looking to do something very similar in my office. Thanks, Lacey! They were a DIY. You can see the process here. I think it looks fantastic! I think as long as it’s chosen well and is high-quality, carpet can be a great choice for rooms like this! Hi. Your new carpet is beautiful. My only concern is what forced air heat does to the carpet around the perimeters. It gets a dark stain that even shampooing can’t remove. 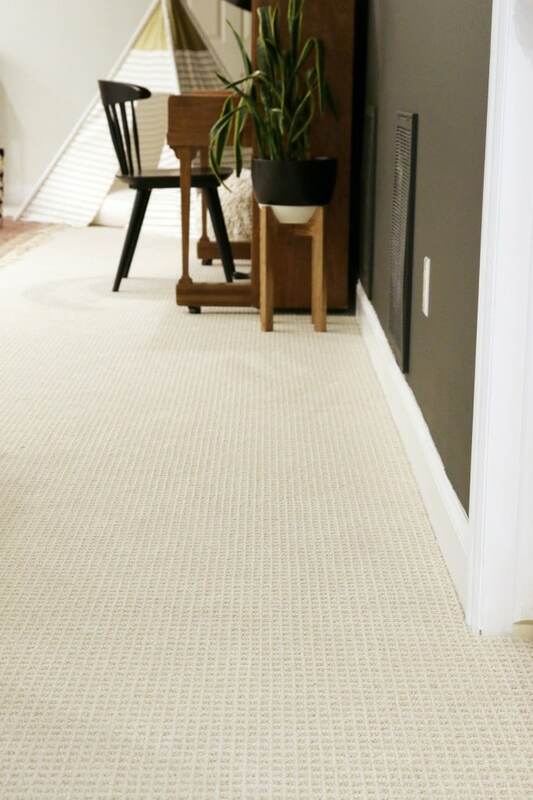 Have you had that experience with carpet in the past? Hmm, we haven’t seen that before or with our last carpet. Love it! I’m in a second-story condo where we’re required to have carpets. Since wall-to-wall carpet gets such a bad rap, there’s not a lot of tasteful advice out there. We’re coming up on having to replace ours, so I’m really looking forward to hearing how yours wears over time. It looks great! Yes! They are about 5″ baseboards with a little detailing at the top, just from Lowe’s (I think these are them). Our baseboards down here used to be, seriously, two inches tall. It has made such a difference! 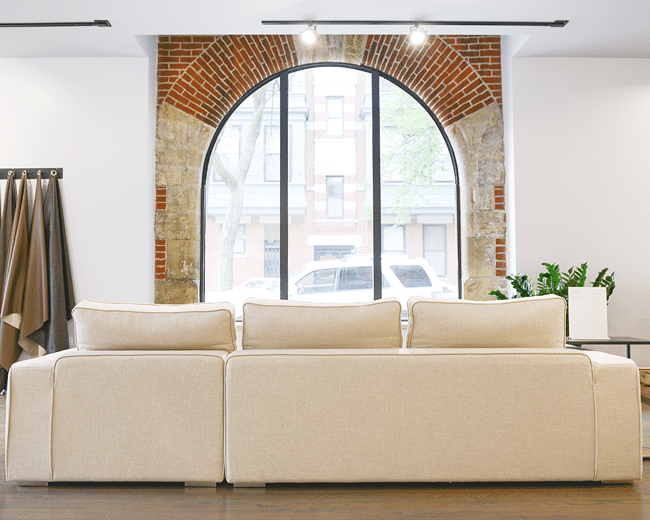 I wasn’t sure if a post about baseboards would make people want to pull their eyeballs out. But they’re beefier and we love them! LOL! Yes a baseboards post could be kind of a snooze fest! I find it interesting only because I am planning out our flooring remodel and blah baseboards are the first thing to go and not come back (besides the skin-your-knee carpet)! Thanks for the link!! Funny I was actually thinking about the baseboards as well. 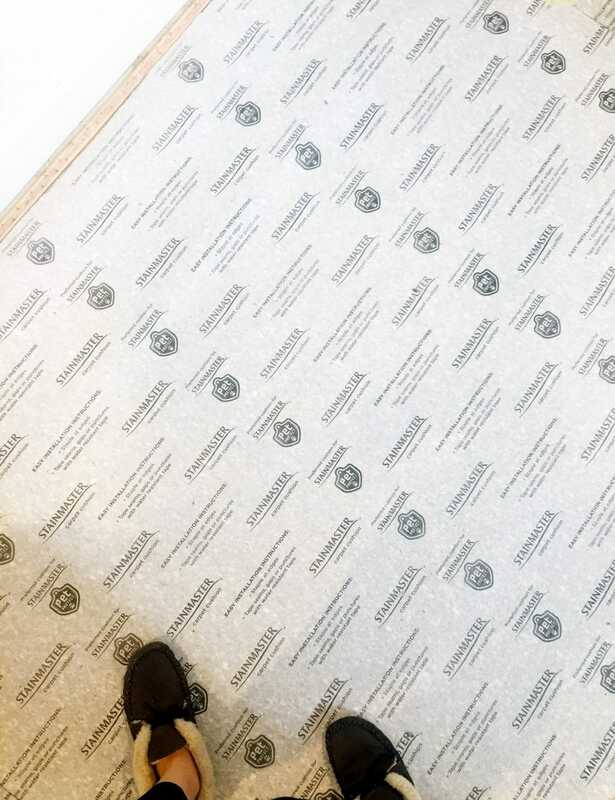 Did you install them before the carpet went in or after? About to change the carpet in my daughter room and we are also re-tiling our whole house so the 2in baseboards are gone! Any additional tips would be great. thank you. Your house is so inspirational. I love your blog, its been so helpful. Dani @ Danielle and Co.
We have fairly light carpet in our whole upstairs (a very similar pattern to yours, too – just a different brand) and ours has been just fine for two years now! I do love how soft and cozy it is – and soft but low-pile carpets are much easier for vacuuming, I think. I don’t end up with that suspicion that pet hair is still deep down in it, like I have when we had higher-pile carpets. Ah! It looks so good! Can’t wait to see the sectional!! Love the carpet! I love the subtle design and the color. I really like the subtle pattern and texture. It’s a beautiful look! Please give us an update on the loop pile + dog after some time… I have never been able to have a loop pile rug because of snags with dog claws, which is why I think I have a such a hard time finding rugs and carpet. Am curious to know if loop pile carpet holds up better than rugs?? Great choice, looks like it’s really coming together! It looks awesome! I admit I was skeptical of that pattern on the stairs, but the result is beautiful and modern. I canned wait to see more!